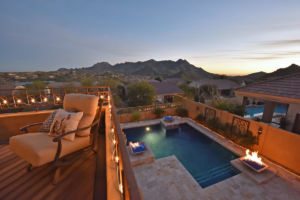 This stunning and impeccably remodeled Saddleback at Troon Village home features custom touches and dramatic views as soon as you walk in the front door. The inviting entryway ushers you inside and the centerpiece fireplace draws the eye to the vaulted ceilings and the walls of windows. 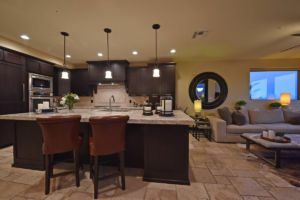 The remodeled kitchen has beautiful dark wood custom cabinetry, stainless-steel appliances, gas cooktop, large center island with bar seating, and granite-slab countertops. 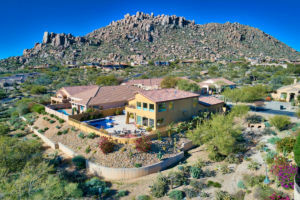 The minimal-maintenance backyard is a paradise with a full landscape remodel, corner pool with fire and water features, covered patio with built-in heaters, built-in BBQ equipped with burners and sink, lounge area to soak in the Arizona sun and panoramic views including the McDowell Mountains and Four Peaks. 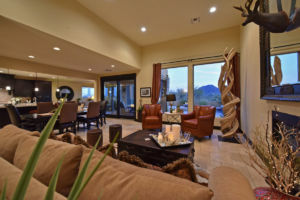 Click here for more photos and a video of this beautiful property!